Although Winnie’s Front Street Barber Shop in Traverse City advertised haircuts, anyone who stepped inside found much more than a fair-priced trim. The enthusiastic banter inside the crowded room nearly drowned out the metallic rasp of the shears. The walls were decorated with rough tree bark to provide a rustic environment, and a carved wooden trout in the front window marked the time remaining until opening day. Men loitered for hours as they conferred about fly fishing, for the venue provided welcome repose for sportsmen. The shop’s owner, Art Winnie, was a respected guide on the Boardman, Manistee, and Au Sable Rivers and cofounded the Traverse City Fly Club in 1913. This talented gentleman bankrolled his fishing obsession by tying flies commercially and reportedly settled his mortgage in similar fashion. 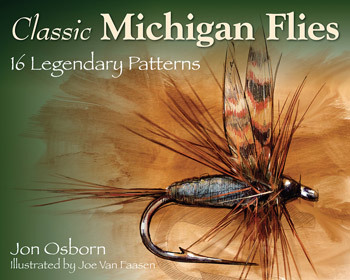 The catchy slogan accompanying his inventory of handmade lures and flies pronounced them “A Work of Art.” Among his original tackle was the Michigan Hopper, better known today as Joe’s Hopper. Although May and June are months of intense mayfly and caddis hatches, the dog days of summer are terrestrial time in Michigan. Hot, windy afternoons deposit crickets, ants, beetles, and grasshoppers on waters like the Pere Marquette in Lake County, a river famous for its brown trout, which rise confidently to the meaty insects when conditions are right. Hoppers can be fished in a variety of ways. 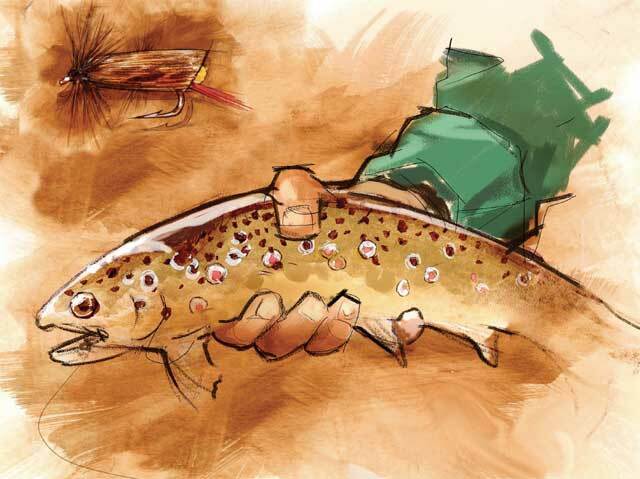 A floating presentation is the most common approach, with the angler alternately twitching and dead-drifting the fly along the bank. Another method is to fish a sunken Hopper, which emulates a hapless locust adrift beneath the surface. This can be particularly effective on bright days when trout are reluctant to come topside to feed. 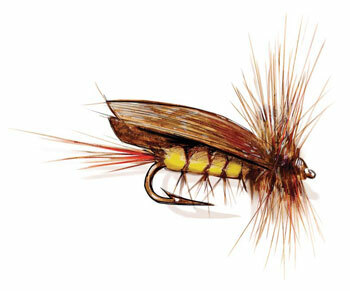 Still another strategy is to use a tandem-rigged Hopper and dropper, with a buoyant Hopper knotted to the leader and a tiny nymph, such as a Pheasant Tail, dangled below. The Hopper doubles as an indicator and attractor, while the nymph draws many of the strikes.